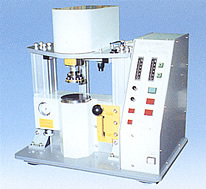 This equipment is to measure the rheologic characteristic within viscosity solution continuously and used in various fields of industry as well as physics and chemical science field.It can be used in quality control of partly-finished products to final products of various solutions.In principal, testing portion is placed in between the rotating circular cone and circular plate, measuring the rate of shear and shearing force that is caused by the spinning, with higher precision electronic sensor, it records on X-Y recorder.SUZAC 855 Model Cone-Plate Viscometer has been remodeled our conventional meter by making it compact size and light weight, improving parts of the torque sensor and lifting plate parts and adding titanium alloy and highly sophisticated engineering plastic material for higher degree of accuracy. Diameter: φ90mm Stainless-steel, Incubation method by inner water flow. Titanium Load Cell which can be used under water and in adverse environment. Displacement Gauge Meter such as Torque Thrust Meter which is advanced version of Strain Gauge. Design and Production of special order measuring equipments and amplifiers.